Home>Music> Meek Mill On DJ Akademiks: "This Like A Mumble Rapper Promo Page"
DJ Akademiks has always been a relatively dramatic figure in the hip-hop world, offering polarizing opinions on a lot of the hot topics being discussed. His friendship with Tekashi 6ix9ine has brought him further infamy as an Instagram and YouTube personality, becoming one of the go-to news sources for anything about the new generation of rap. Meek Mill, unfortunately, suffered a leak of his EP Legends of the Summer last week, resulting in a significantly lower number of sales and streams as what was expected. When Ak posted the sales projection for Meek's newest project, the rapper took it as somewhat of a dig considering Future's new mixtape sold double the amount. Sliding into the comments section, Meek spoke his mind, reminding us that he won't be discredited. The Philly native wrote, "3 songs leaked and we put them on platforms a week later lol I wasn’t suppose to drop any music until my album came out but no excuses 'take dat' 😬 and stop the sideways tryna make me look bad stuff my leaks did 30k first week and I’m mad about it lol I gotta follow this page and keep my eyes on y’all, this like a mumble rapper promo page ' album almost done.'" 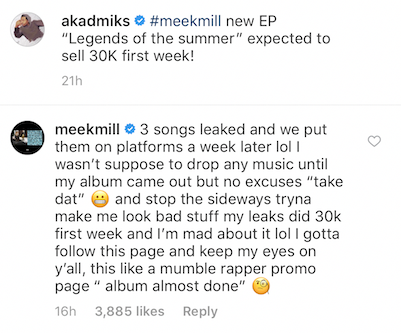 With some good news sprinkled in at the end as he revealed his next album is on the way, Meek seems to believe a sneak diss was definitely being extended by Akademiks. While that may never be confirmed, it's worth it to wait and see the numbers his album will pull. Check out his response below. Music News Meek Mill DJ akademiks instagram instagram beef Legends of the Summer new ep new eps sales projection comment instagram comments instagram comment comments section Comment Section comments mumble rapper "mumble rap"
Wiz Khalifa Talks Air Jordans, Vans & More On "Sneaker Shopping"
MUSIC Meek Mill On DJ Akademiks: "This Like A Mumble Rapper Promo Page"